IT’S often said there’s more than one way to skin a cat but it’s highly unlikely I will ever be in a position to prove that. I’m no Freddy Cougar, after all. But one of the joys of doing multiple rounds of Munros is the option of climbing the mountains by different routes. Sometimes an alternative approach can prove better than the original, bringing new life to what had been a soulless trudge with previously hidden delights. Other times it can be a brave, but ultimately inferior, experiment, one that can be written off to a misplaced spirit of adventure. 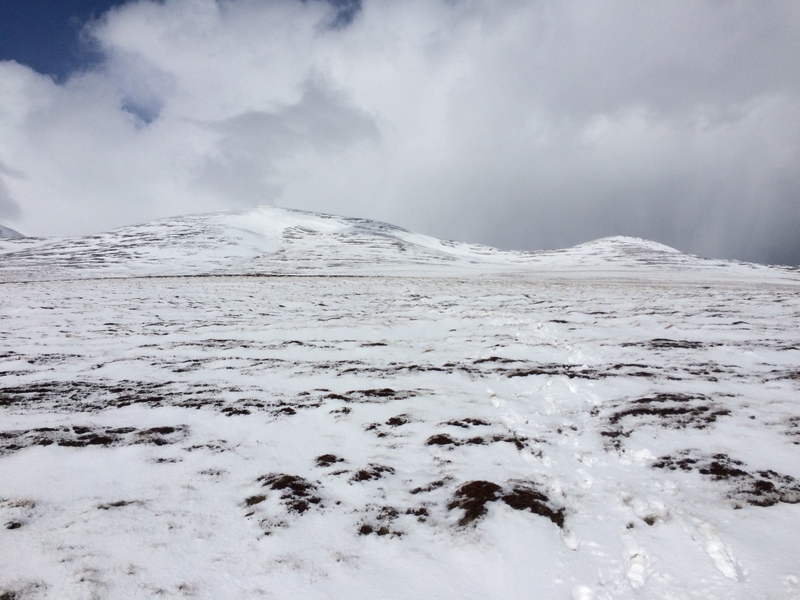 The trade circuit of Beinn Bhreac and Beinn a’ Chaorainn is generally regarded as one of the least exciting Cairngorms routes, especially as it includes a long bog trot. I think that is unfair. My fourth time round was in winter conditions and choosing to do them the opposite way was a great move. 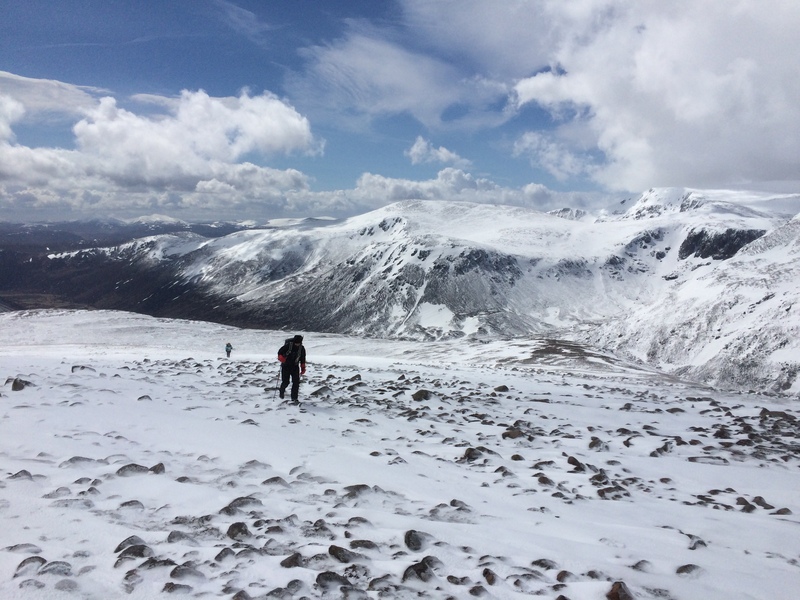 Most people trek up Glen Derry for around half an hour before heading steeply east on heathery slopes for the twin summits of Beinn Bhreac, then north to Beinn a’ Chaorainn before dropping down into the Lairig an Laoigh for the return journey down Glen Derry. Dividing the two Munros is the Moine Bhealaidh, a five-kilometre stretch of peat hags, pools of water, bog and saturated vegetation. It can be awkward, it can be wet but it’s also a place of stark beauty, whose silence is broken only by an occasional bird call or disturbed by a hare suddenly dashing out from under your feet. The first time I crossed the yellow moss was on a perfectly clear and dry May day. The path was obvious, Beinn a’ Chaorainn in full view, drawing me onward with only minor diversions. Next time out was also dry and cold, old snow still clinging to the heights but leaving the way clear for the crossing. But then I had an altogether different experience, a cold, autumn day with raging winds and clinging low cloud that brought an air of menace to the landscape. This was an intimidating and unsettling place to be. We used the path and stuck doggedly to our compass line even though it meant wet feet at times and we eventually reached our goal despite fierce gusts doing their best to blow us off course. However, a lone walker we had spoken to on Beinn Bhreac was wary at the thought of a sightless crossing. We noticed him following at one point. A few moments later, he was gone. We never saw him again. I assumed his nerves had got the better of him and he decided to bail out. 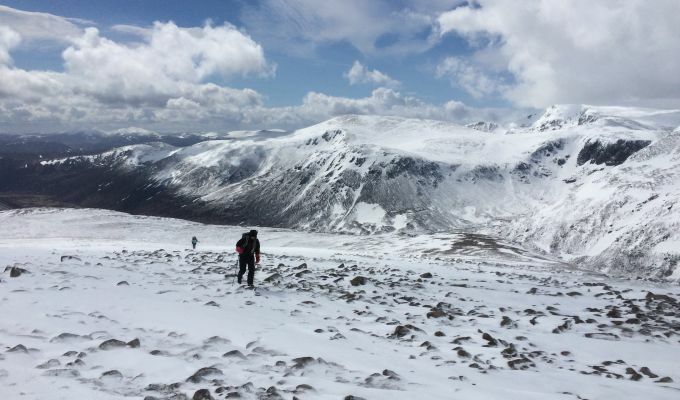 This time, with snow lying thick on the high parts and driving in regularly from the north, myself and two friends continued several kilometres further up Glen Derry to where the path splits and then climbed through deep powder snow to Beinn a’ Chaorainn. That gave us the advantage of having the wind behind us as we headed south over the moss, but the disadvantage of the path being buried. It meant sinking thigh-deep at times and even having to crawl or roll across sections to distribute our weight better and avoid another soaking. At one point, we were treated to a great nature show, a lone hare going beyond the bounds of normal flight patterns to keep running for miles, keeping us watching in awe as he raced vertically up a wall of snow at high speed. We felt sure he would tip backwards but he made it all the way to a round of applause. The wind at the summit of the lower Beinn Bhreac was now stronger than at any other point of the day so that alone justified our route reversal. I would not have fancied walking into it. The final plus was that we traversed the minor top of Meall an Lundain to drop out on the track just half an hour from Linn of Dee, saving a few extra miles. As far as cat skinning goes, it was a winner.